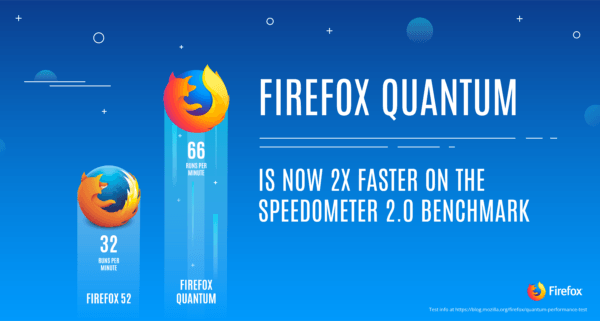 Mozilla today announced that its significant overhaul of the Firefox browser — called Firefox Quantum — had entered the beta stage, making it tantalisingly close to a general consumer release. Firefox Quantum isn’t an incremental release, but rather a significant step forward for the enduring Chrome-challenger. It’s geared to take advantage of multi-core setups, as are so common in today’s computers. For instance, Quantum ships with a brand new CSS engine written in Mozilla’s Rust programming language. Unlike other browsers, this can work in parallel across cores, rather than as one large process on a single core. It also prioritises tabs based upon the order you’re using them. Tabs actively in-use download and render before other background tabs. Mozilla says this makes Firefox 30 percent more RAM-efficient than Chrome, in addition to being significantly faster, too. Mozilla has also undertaken a significant effort to remove bottlenecks from Firefox. The company says it has squashed 469 bugs that impacted performance. Of course, some changes are skin deep. Firefox Quantum looks measurably different, thanks to the efforts of the Photon Project. This is a more minimalist re-imagining of the browser. It also looks great on high-DPI displays, which I’m personally pretty excited about. I used Firefox on a 4K monitor a few months back, and things just didn’t seem to gel as well as they did on a bog-standard 1080p screen. Given 4K displays are increasingly common on mid-to-high-end computers, this makes a lot of sense. You can read more about Firefox Quantum here. Thankfully, you won’t have to wait long, as it’s got an expected release date of November 14. Should you be so inclined, you can download the beta here, and test it out today. It’s available for Linux, MacOS, Windows, Android, and iOS. It also comes in a Developer Edition, for those who build for the web, and want to see what the cutting-edge of Firefox looks like.